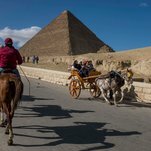 Ahmed Kamel, a wiry young man who speaks several languages, offers buggy rides around the pyramids for about $ 9. On a bustling, recent Friday afternoon, he patted his horse fondly as Egyptian pop music known as electro shaabi blared from a speaker. A few years ago, one Swiss tourist was so appalled at the sight of a suffering donkey that she paid 800 euros, or about $ 900, to have the animal treated and transported to Switzerland. Ms. Abaza intervened, and persuaded the Swiss woman to leave the donkey at her sanctuary south of Cairo.